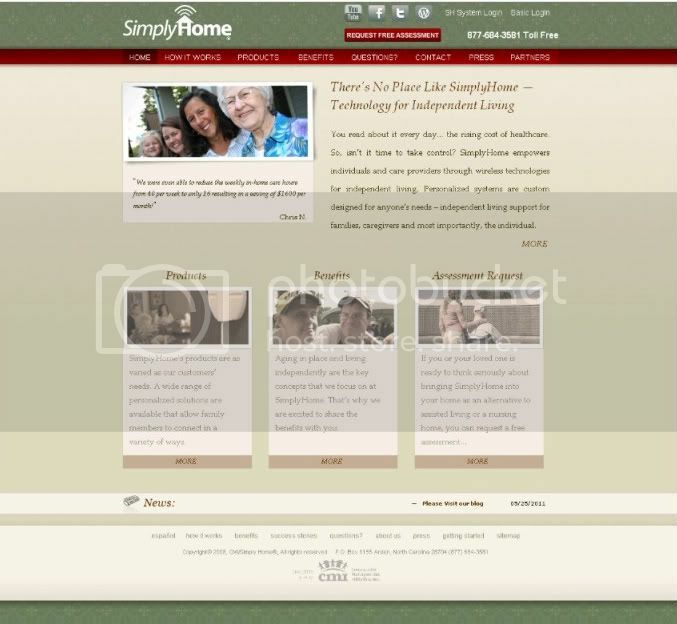 Over the last several months, SimplyHome has been quietly busy on an overhaul of our website, www.Simply-Home.com. The website is our portal to provide information about our technology, which can improve the lives of your loved ones by allowing them the independence they deserve. The new and improved site launched Friday with a complete redesign and new architecture. The main navigation tabs are the gateway to the site: Home (who we are and what we do, social media, what's happening now), How it Works (Getting Started, SimplyHome System, PERS Plus), Products (systems, pricing, needs and concerns), Benefits (for seniors, families, disabled and developmentally disabled, home health providers, assisted living facilities, long term care facilities), Questions, Contact, Press (SimplyHome in the media), and Partners (location and description of our partners). At SimplyHome, our goal for the new website is to provide our visitors with an extremely user friendly website. The new innovative site will offer more functionality and easier navigation with more in-depth information about our technology. Product Page: SimplyHome prides ourselves on selling an outcome rather than just the equipment. We did have several requests though, to include more information on our product, such as, pictures and pricing. We have also launched a new leasing option that we are proud to offer. Improved site navigation: We implemented recommendations to make it much easier for you to find key information and content. The main navigation, as well as sectional navigation throughout the site, have been revamped to bring content to the forefront. Updated content: We didn’t just take the content we had and reorganize it to make it easier to find. A major effort to update all of our content was undertaken to bring you more relevant information. We hope you will take a moment to visit the site and let us know what you think!